We have recently ran what might be PC-industry changing stories about Qualcomm, Microsoft and PC systems maker partners introducing so called Always Connected PCs. Today we had a closer look at the Asus NovaGo Gigabit LTE-capable laptop convertible. These initial devices are powered by Qualcomm Snapdragon 835 SoCs and owe their outstanding features of portability, connectivity, and battery life to this choice. Now Qualcomm has launched a new flagship processor which will become available in devices "in early 2018", it's called the Qualcomm Snapdragon 845 Mobile Platform. The Snapdragon 845 will be built by Samsung using its latest 10nm LPP process technology. Processor sampling is currently underway and it will be found from early next year in smartphones, XR headsets and always connected PCs, confirms Qualcomm. Qualcomm's new SoC includes multiple upgrades to its important subcomponents such as CPU, GPU, DSP, ISP, modem and more. The CPU portion of the SoC is called the Kryo 385 and packs four performance cores running at up to 2.8GHz, and offering a 25 per cent performance uplift compared to previous generation according to Qualcomm. 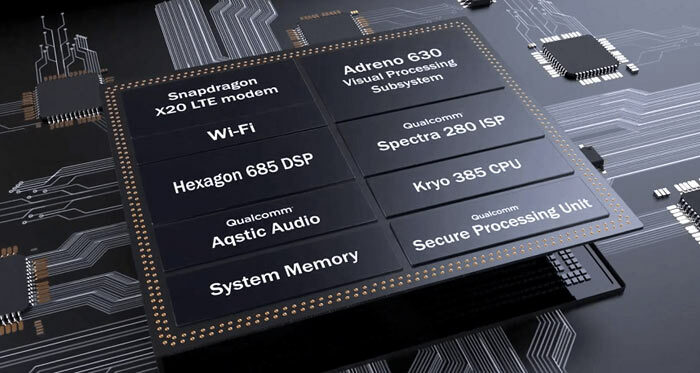 The Adreno GPU has also been upgraded to deliver 30 per cent better performance and power consumption reduction compared to the previous gen. Qualcomm has added features to the GPU to improve 6DoF simultaneous localization and mapping, with hand tracking and controller support. Moving on to other important SoC sub-components Qualcomm wants to highlight the integrated Qualcomm Spectra 280 image signal processor (ISP). Alongside the GPU this new ISP enables "high-performance, true-to-life cinematic video capture, along with superior photography". The combination facilitates capturing of 64x more high-dynamic range color information for video capture and playback on Ultra HD Premium displays compared to the previous gen.
AI is increasingly listed high up on the feature set of smartphones, and Qualcomm has improved AI performance threefold in the Snapdragon 845. As well as powering pertinent virtual voice-based assistants, the AI power can be used for photo taking and processing and better VR gaming. AI assistants can become more useful with the always-on keyword detection and ultra-low-power voice processing facilitated by the Qualcomm Aqstic audio codec (WCD9341). The Qualcomm Hexagon 685 DSP is the main muscle for AI and certain image/audio calculations. Support for Google’s TensorFlow / Tensorflow Lite, Facebook’s Caffe/Caffe2, and Open Neural Network Exchange (ONNX) frameworks are provided in the Snapdragon Neural Processing Engine (NPE) SDK. 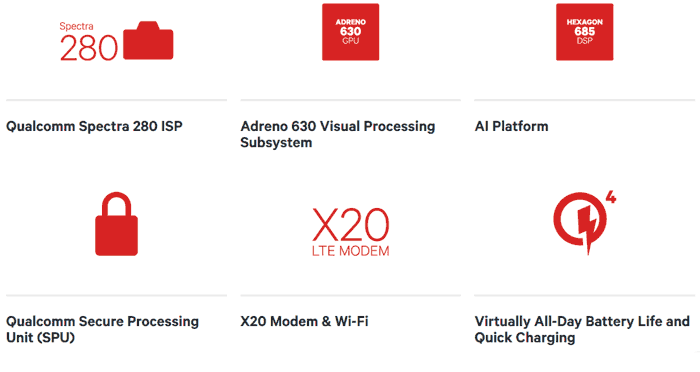 For that all-important mobile connectivity the Snapdragon 845 leverages the Snapdragon X20 LTE Modem. It supports 1.2Gbps Gigabit LTE Category 18, LAA, CBRS, and Dual-SIM Dual VoLTE. In addition built-in 60GHz 802.11ad Wi-Fi can power transfers at up to 4.6Gbps, and there is support for dual-band 802.11ac Wi-Fi and Bluetooth 5. Last but not least Qualcomm's Secure Processing Unit is enabled for biometric authorisation (fingerprint, iris, voice, face), user and app data protection, and integration with secure messaging and payments etc. Hopefully it will get used for more than facebook and clash of whatever…. Thanks just registered Clash of Whatever!